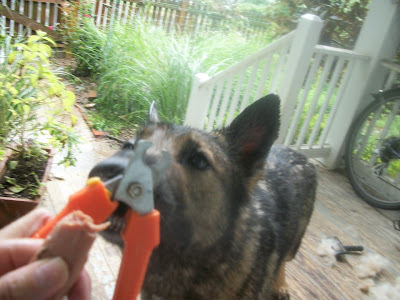 Recently I had a grooming client who came to me because her dog, a 130-pound German Shepherd, had come from the breeder as a puppy with freshly-clipped nails still bleeding. Not surprisingly, this gentle giant is terrified of having his nails done and his human has been forced to bring him to the vet, where he requires 4 people to hold him down to get the dirty deed done. Much to her credit, his human wanted to find another way and my friend Jill at Happy Hound Pet Care referred her to me, as most groomers don't seem to think about the dog's well-being or anything besides just getting the job done. There seems to be very little discussion in the grooming community about desensitization. Professional groomers often invest in sophisticated restraint systems or pay lots of assistants to hold feisty dogs down. Most people who bring their dogs to the groomer, likewise, just want to get the dog groomed and don't think a whole lot about the dog's experience. As a "grooming hobbyist" myself, I have the luxury of being primarily interested in giving dogs a good experience. I'd rather take the time to work with their emotions rather than just restrain their bodies. Far better to have long nails for a while than to have a dog who's even more terrified for the next trip to the groomer. 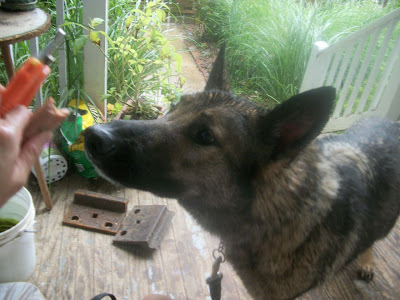 With our large GSD, I explained beforehand that we were going to set as a goal not actually getting the nails done, but getting the dog to feel differently about those clippers and about having his paws touched. We used the basic process outlined on this great site. I have since learned that Ximena at Identity: V has also done a really incredible blog post on the importance of nail trimming and how to do it right. Like many GSDs, this dog was anxious, pacing, constantly mobile, and vigilant throughout our session. We ended up clipping a total of the tip of one nail, but we did make some progress toward helping him feel like the clippers are an opportunity for attention, play, and treats rather than terror. Hopefully his people will keep working with him, and will follow up on my advice about using an anxiety wrap and doing relaxation exercises to help him settle down in general. I think it would serve the grooming profession well to have more of us versed in desensitization and counterconditioning techniques, and more of us advertising up front that getting a frightened dog fully groomed, and all the rehabilitation that may entail, could take some time. What do you think? Would a groomer who advertised "More relaxed dog guaranteed. Actual grooming results may vary" get any business? Hi Kirsten, a very worthwhile post. Right from the beginning, we have touched every part of their bodies, many, many times over in a bid to desensitize them to people touching and handling them, particularly groomers. And while Sam was initially apprehensive with the groomers holding his front paws, we're worked on that and Sam is more comfortable with the whole process. Great post! I clip their nails at home, even refusing to let the vet do it when they offer. There are lots of treats and praise going on and though none of the dogs particularly like it, they tolerate it and I know they are more relaxed about it than if a stranger were to try, which is why I do it at home. Usually we only do one paw or just the front or back in one sitting so as not to stress them out too much. Great post! I love to see this - and yes, if I got my dogs professionally groomed, I'd much rather the dog be happy and relaxed than that I get a perfect result. I am really glad to read this post. I am often worried about what happens at the groomers, since every one I bring Finn too, she gets more anxious about being there than when we go to the vet. I would much rather try to find someone who would work with her than just hold her down. Great resources! Great post and topic. I would rather my dog be nice and relaxed and come out of it with a better experience than to have all nails done at one time. I'm a groomer, and yes, some of my clients are scared dogs (and cats!) that haven't fared well at other salons. I do mobile grooming and go door-to-door. Owners are present, and sometimes are required to help get the job done safely and peacefully. Some don't want to pay (and I find that some hate investing the TIME even more than the money!) but most contact me because they were unhappy with the results they got elsewhere. The first and most important aspect of grooming is building a relationship with the individual animal. Some people are jealous! Yayyyy! Thanks for the mention! My last dog, a Spaniel mix, was told never (seriously, the woman told the dog, not me) to return because she got so stressed out and would try and bite...a behavior she never exhibited anywhere else. I stopped taking her to a groomer after that. I would have loved a groomer who offered a fun, relaxing experience for my dog (preferably in my own home) even if all she got out of it was a simple brushing. Thank you for the great feedback everyone. I am glad that so many people are open to the idea of desensitization, even if it takes longer. Sarah, I think its good that you do it yourself--I actually recommend this to some people whose dogs are really stressed about coming elsewhere and being handled by a stranger. Maybe that's why I'll always be a grooming hobbyist, and not a busy professional! LynnO, I think having the client help out is a great strategy. Some dogs seem more nervous with the owner present, but in some cases it definitely makes it easier! Marji, I've had those dogs who want to take my throat out while I'm grooming them. 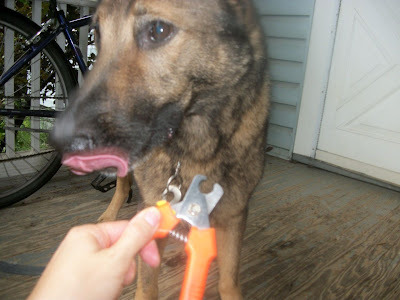 The fact is that a lot of the parts of the grooming experience are not super fun for the dog no matter how you do them--I wouldn't want a stranger shaving my entire body, cleaning out my ears, and clipping my nails either! This is why I do a lot of gentle touch and handling as part of my training classes--so the dogs get used to being touched by strangers. We're gonna check out those links! Mom has varied success with nail trimming around here. Most everyone lets her do it if the mood is just right, except Kayla. No amount of treats and desensitizing has helped her so far so it's off to the vet we go. But our vet techs are GREAT at it! Road dog, I bet you're right that some dogs are just too constitutionally nervous to tolerate something as stressful as nail clipping. In those cases, I think tranqs are in order--and I have said as much to some of those clients whose dogs wanted to rip my throat out! I have got a real phobia about trimming nails. Thankfully Frankie's don't need doing as they are white and soft and he keeps them worn down. But Beryl's are like talons and I get a friend to dremel them every week or so but the quicks just won't recede. She doesn't enjoy having them done but she is good. I'd love to do them myself:( Great post and links but there's nothing about desensitizing me! And yes, I'd pay more for a positive groomer if I needed one. I've found one of those wonderful groomers who put making Honey comfortable her highest priority. What a gem! We've worked hard with Honey from the beginning to make nail trimming easy. But it's still not something she loves. 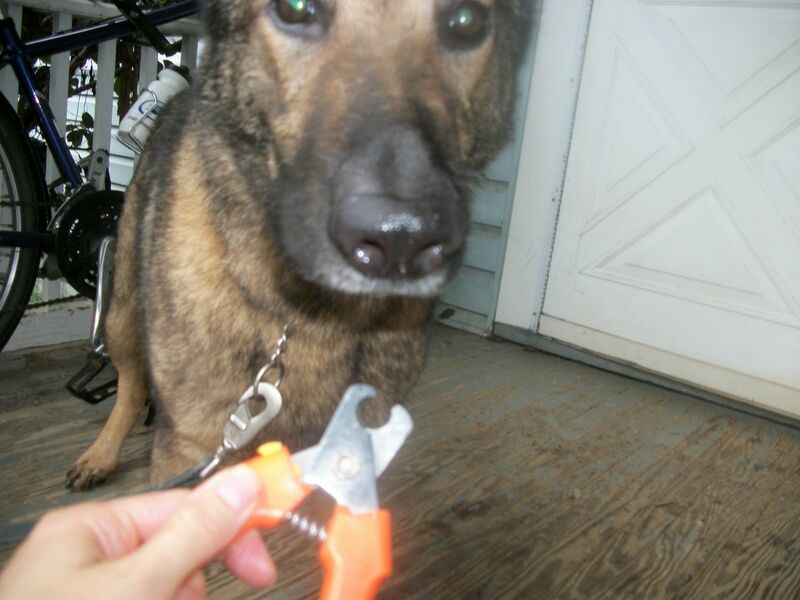 What's helped a lot is making sure we clip nails when they're wet. Just like humans, they're softer and the job goes easier. My dog has no problem with nail clipping-- I DO. I'm completely phobic of clipping too close, and thus the vet does it. And his nails are 'way too long!